Outstanding colt The Autumn Sun made it career win No.8 – and G1 win No.5 – at just his ninth career start with another hard-fought victory in the Guineas. As has been the case with his two other wins the preparation, The Autumn Sun looked to be under siege but his trademark fight and determination kicked in to again hold his challengers at bay. The success, which came on a heavy Rosehill surface, took his career earnings to almost $3.5m. The Autumn Sun is a $700,000 Australian Easter Yearling Sale buy for Hermitage Thoroughbreds and Chris Waller Racing, from Arrowfield Stud. He was co-discovered at the Easter Sale by Guy Mulcaster, who was again trackside at Rosehill to watch the mighty colt win again today. Ollie Koolman, representing part-owner The Hermitage, described the win as “gutsy’’. “These aren’t ideal conditions for him but he’s got determination beyond his athleticism and his athleticism speaks wonders,’’ Koolman said. “He’s a fair dinkum athlete bit his biggest asset is his ticker. Co-owner, breeder and vendor John Messara, from Arrowfield Stud, was full of praise for The Autumn Sun, who will stand at Arrowfield in retirement. “This is not his ground, he didn’t enjoy one ounce of the race yet he toughed it out,’’ Messara said. The Autumn Sun’s Not A Single Doubt three-quarter brother (ex Azmiyna) is lot 369 at next month’s Easter Yearling Sale, where he will be offered by Arrowfield. The Easter Sale is at Riverside Stables on April 9 and 10. And Nature Strip got the G1 win he so thoroughly deserved with an all-the-way victory in The Galaxy. In doing so he became the third consecutive Inglis graduate to win The Galaxy following the successes of In Her Time (2018) and Russian Revolution (2017). The win gave Nicconi, who stands at Widden Stud, his maiden G1 victory, to the delight of farm principal Antony Thompson. “He’s definitely a Group 1 sire and he’s been all over it, his runners have been there in the mix in so many big races so it’s a great relief to finally break through,’’ Thompson said. Nature Strip is a graduate of the Melbourne Premier Yearling Sale, where he was offered by Golden Grove. He becomes the 10th individual G1-winning Inglis graduate in 2019. 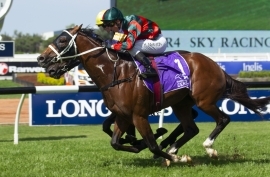 And Semari (Sebring x Kumari) made it three consecutive wins when she claimed the G3 Epona Stakes at Rosehill. It was the sixth career win for the 4YO from just 11 starts. Semari is a graduate of Inglis Easter, where she was bought for $150,000 by Tru Blu Bloodstock, from the Little Avondale Stud draft. In Perth, 2YO filly Rio Del Mar announced herself as a quality youngster with an impressive win in the G3 Gimcrack Stakes at Ascot. At just her second career start, the daughter of Magnus proved too strong, scoring a valuable Stakes victory early in her career. Rio Del Mar is a graduate of the Australian Broodmare and Weanling Sale, where Aquanita Racing bought her as a weanling for $20,000 from Erinvale Thoroughbreds. Meanwhile on Friday night at Moonee Valley, 2YO Snitzel filly Cheer Leader made her maiden win a Stakes one when she gapped her rivals in the Listed Valley Pearl. At just her third career start the Makybe-bred juvenile – a $300,000 Inglis Easter buy for Yulong Investments from Milburn Creek – kicked clear of her rivals at the top of the straight, winning by five lengths. *THE AUTUMN SUN won the G1 Rosehill Guineas today. His Not A Single Doubt three-quarter brother (ex Azmiyna) is lot 369 at Inglis Easter, offered by Arrowfield Stud. *ALL TOO SOON ran 3rd in the G3 Epona Stakes at Rosehill today. Her brother (All Too Hard x Gallant Tess) is lot 26 at Inglis Easter, offered by Kitchwin Hills. *SUNLIGHT won the G1 William Reid Stakes at Moonee Valley on Friday night. Her Sebring half brother (ex Solar Charged) is lot 274 at Inglis Easter, offered by Widden Stud. *SPRIGHT ran 2nd in the G1 William Reid Stakes at Moonee Valley on Friday night. Her dam Dashoff is entered in the Chairman’s Sale as lot 46, offered by Rothwell Park.